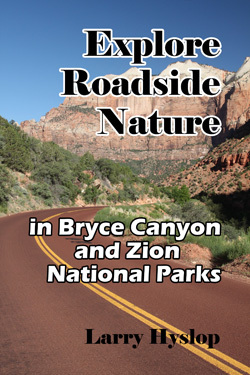 40 brief descriptions and explanations of plants, animals and geologic formations seen along park roads. Each subject is associated with a specific spot on these roads. Increase your enjoyment of Bryce Canyon National Park and Zion National Park. Discover fascinating details and facts about these world-famous, red-rock natural worlds. At Bryce Canyon’s Visitor Center, why do ponderosa pine trees need wildfires? At Paria View Overlook, why did hoodoos form at this spot? At Zion’s Big Bend Shuttle Stop, are California condors returning to the park? At Checkerboard Mesa, what created this checkerboard pattern? You will enjoy these articles in preparation for a park visit. You will discover interesting details while traveling the roads of Zion and Bryce Canyon. You will find answers to questions that come up following a visit. Articles are searchable by road location and subject matter. Photos of each subject and the location enhance the descriptions.